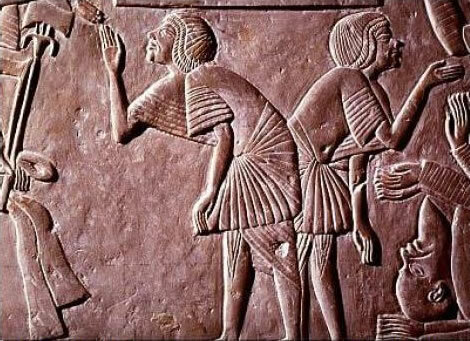 This picture first appeared in an article titled: “The Earliest Depiction of an Interpreter” from the Unprofessional Translator Blog. 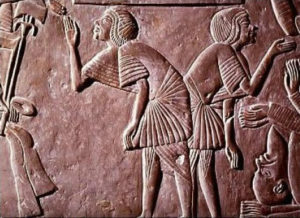 The picture is taken from a frieze from the tomb of Harembab, an Egyptian Pharaoh. The frieze is currently housed in the National Antiquities Museum at Leiden, Holland. If you look carefully, the interpreter is shown as having two bodies in this picture. Each body facing one of the speakers. This picture has been food for thought to me for a long time. This is exactly what interpreters do! This duality aspect is a true fact about the nature of our work. In order to convey meaning, we connect simultaneously with both speakers at the linguistic, social, cultural and educational levels. There is always two of everything as each speaker belongs to a specific society and culture, some speakers also come along with their professional culture such as the legal or medical culture. There are two sets of educational levels and two sets of etiquette and behavior that are evident in the way each speaker expresses. All these factors interacting literally “through” the interpreter. In fact, a case of “dual personality” going on for the interpreter! So, every time I see this picture, I realize that I am the medium and the vessel for all this dual activity and that moving from one speaker’s vision of the world to another’s is what I do every time I am interpreting. If you want to learn more about the history of this picture, visit the Unprofessional Translation Blog. Yes, it has to do with languages, but a professional translator works with language in the written form. Translators are indeed competent in their mother language (language A) and in one or more foreign languages (languages B and C). They primarily translate from languages B and C into language A. The reason for this is that often the highest level of competence will be in the mother language or language A. Some translators are highly bilingual or very knowledgeable in one specific subject matter, and are capable to translate from language A into language B or C.
Translators’ linguistic skills focus mainly on reading and writing therefore, many translators may not be fluent speakers of languages B and C, and that is fine as what they really need is high reading and writing linguistic skills. When buying translation services, you want to make sure that the translator is a native speaker of the language your document is going to be translated into, or at least with highly competent in language B or C, and with a good knowledge of the subject matter. © 2009-2019 Lingua Franca Inc. - Interpreting and translation services in the Mid-Atlantic region including Baltimore MD, Wilmington DE, Philadelphia PA region.